Orthokeratology, or Ortho K, is similar to what Orthodontists do with teeth. In the way that braces reshape the teeth to improve their appearance and function, the Ortho K lens uses the same principles to gently reshape the surface of your eye to improve your prescription. Unlike braces though, you only need to wear your Ortho K lens at night-time—that’s why it’s sometimes called ‘overnight vision correction’. Ortho K is safe, effective and fully reversible—a better alternative to laser eye surgery. Ortho K is most effective with myopia (short-sightedness) but can also be effective for long-sightedness, astigmatism, and even for reading. The aim of Orthokeratology treatment is to allow our patients to see with maximum clarity of visionwithout the use of prescription glasses or daytime contact lenses. Ortho K has been proven clinically, anecdotally and within our practice here at In2Eyes to dramatically improve vision in our patients and we have been able to achieve very good results in a very short time frame. Does Ortho K Work As A Myopia Treatment? In2Eyes are proud to offer orthokeratology to Surrey Hills locals looking to treat their myopia. Ortho-k has been shown to gradually correct myopia, offering clear vision after just a few nights of use. This non-invasive, reversible treatment is especially effective for myopia, with the lens gently reshaping and correcting the cornea overnight. Ortho-k is a particularly good option for children with myopia, as the lenses slow down the progression of myopia and the deuteriation of your child’s eyesight. In fact, Asian children are more susceptible to myopia, so In2Eyes urge parents in and around our Surrey Hills clinic to consider whether their child may benefit from orthokeratology. As we are the experts in orthokeratology in Melbourne, you can be sure your child will be in the right hands at In2Eyes. Seek myopia treatment at our Surrey Hills clinic today by calling In2Eyes. Orthokeratology lenses are specially designed rigid gas permeable (RGP) contact lenses. This means that they are ‘breathable’ which ensures eye health and comfort is maintained as you wear them overnight. While you are asleep, the Ortho K lenses gently reshape the front surface of your eye (cornea) so you can see clearly the following day once you remove the lenses in the morning. Who Is Suited To Ortho K? At In2Eyes we normally use Orthokeratology for patients with upwards of -6.00 diopters (D) of myopia. Ortho K also can correct lesser degrees of astigmatism, hyperopia and presbyopia. It is important to realise that each patient (and each eye) is different – the type and amount of refractive error that can be effectively managed with Ortho K will be treated on a case-by-case basis. There is a very high chance you will be a candidate for Ortho K so please don’t hesitate to contact us if you would like clarification or more information. You are welcome to book in an appointment for an initial Orthokeratology consultation to assess your suitability. What Happens During The Ortho K Consultation? During your Ortho K appointment we will use state of the art Corneal Topography (mapping) technology to measure the exact shape of your cornea. We use this data to tailor the Ortho K lens specifically to each of your eyes in order to aim for maximum improvement of your vision. When your lenses have been produced, we will fit them in the consult room and take more measurements to ensure the perfect fitand refraction has been achieved. We will show you how to wear your lenses and to care for them so you will be fully confident after your Ortho K consultation with In2Eyes. When you are comfortable with inserting, wearing and removing the Ortho K lens on your own, you can wear the lens overnight. The lens will immediately start to reshape your Cornea while you sleep. You will be required to come in the next morning so we can assess the amount of improvement to your vision. Some people have significantly improved vision at this stage so prepare to be amazed! A second appointment will be required after 1 week to ensure there is continued improvement in your vision. We will perform more Corneal mapping of your eye in order to assess the quality of improvement and effectiveness of the reshaping. By this point your vision will have improved significantly. We will advise you if further consultations are required and when you will need to come in again for further reassessment. How Long Will Ortho K Take? Ortho k lenses improve your vision after first night of wear. During the first week that you wear your lens you will notice the quality of your vision improving as the quantity of correction increases. By the first week your vision will have improved significantly and, in many cases, perfect or near perfect vision is achievable by the first or second week. Is Ortho K Safe? Does It Hurt? Many patients who choose to use Ortho K lenses are already contact lens wearers so do not feel significant discomfortwith the night-time lenses. 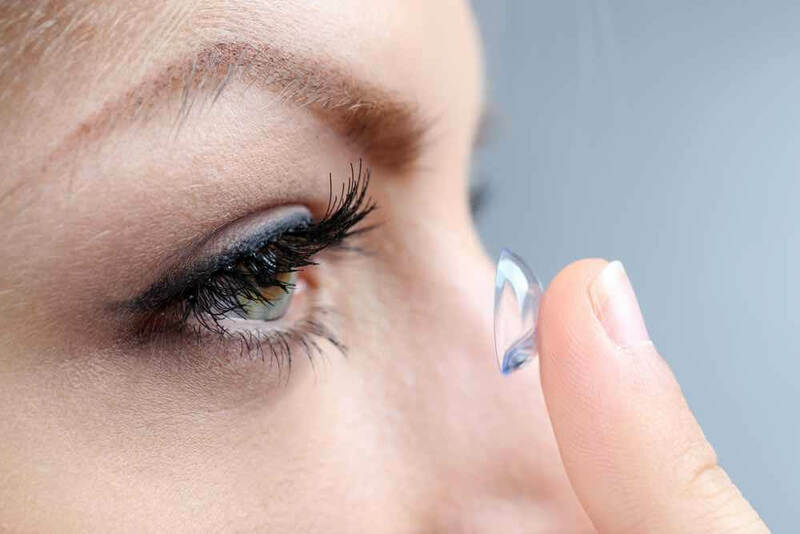 Those who have no experience with wearing contact lenses may feel initial discomfort which the body soon adapts too. On your first fitting we will ensure you are very comfortable with the insertion, wearing and removal of the lenses and, if required, we can apply topical anaesthetic eye drops so you won’t feel anything. Ortho K lenses are worn at night so any discomfort is soon forgotten as you will be asleep. What If I Change My Mind? Is Ortho K Reversible? Yes, Ortho K is fully reversible! Unlike laser eye surgery, Ortho K does not damage or thin your cornea. This means you are able to stop wearing the lenses for short periods (for example, holidays) or permanently—which will result in your cornea reverting to 99% normality within 5 days. How Much Does Ortho K Cost? Fitting Ortho K lenses is a more time-consuming process and requires more expertise than fitting regular contact lenses. It requires a series of consultations with the optometrist and potentially multiple sets of lenses. However, once fitted, Ortho K is less expensive than most daily disposable contact lenses. Ortho K is also significantly cheaper than Laser Eye Surgery or LASIK. Generally, the costs of Ortho K, including follow-up care associated with fitting the lenses, will vary depending on the type and degree of your refractive error and whether you are choosing Ortho K lenses for long-term myopia control in addition to the temporary correction of existing myopia. 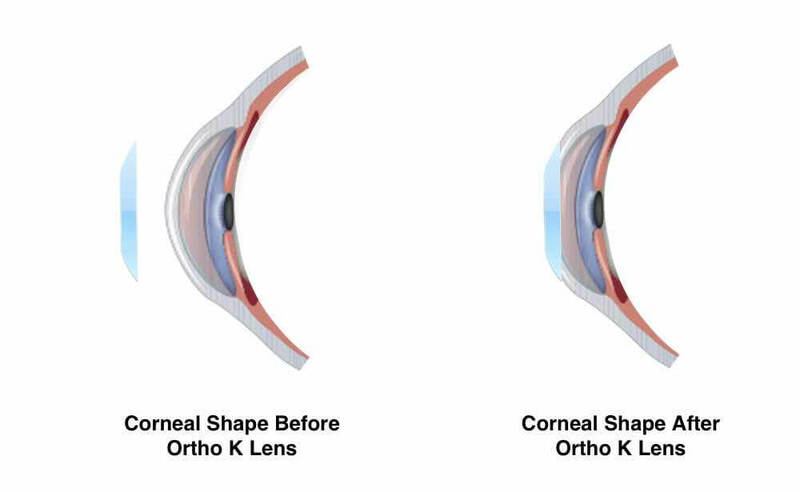 Patients who use Ortho K lenses are required to attend several follow-up consultations at In2Eyes in order for their optometrist to assess the quality of the lens fitting, the degree to which Visual Acuity (VA) is improved as well as to ensure that the patient is maintaining the lens cleanliness. These consultations are also a good time to bring up any questions or concerns you may have with your optometrist. In order to get optimal results from your Ortho K lenses you will be required to visit your optometrist at In2Eyes several times in the first year. The following table is a guide to a normal Orthokeratology patient schedule. High Myopia–Partial Reduction Ortho-k: A 2-Year Randomized Study: This single-masked randomized study showed that partial reduction orthokeratology effectively slowed myopic progression in high myopic children (aged 8 to 11 years). Axial length elongation was 63% slower in partial reduction orthokeratology treated children compared with children wearing spectacles. Corneal Reshaping Influences Myopic Prescription Stability (CRIMPS): An Analysis of the Effect of Orthokeratology on Childhood Myopic Refractive Stability: To determine whether overnight orthokeratology (Ortho K) influences the progression rate of the manifest refractive prescription in myopic children, when compared with an age- and refraction-matched spectacle-wearing control group, over a period up to 8 years. This retrospective study provides evidence that Ortho K treatment reduces, and in some cases, appears to fully arrest the rate of progression of myopia refractive error in myopic children over the long term. In addition, our data offer early insight into a potential indicator that may help predict the extent of refractive stability in individual eyes undergoing OK treatment. Orthokeratology for slowing myopic progression in a pair of identical twins: Comparing the axial length elongation and change in refractive errors in a pair of identical twins wearing orthokeratology (ortho-k) and single vision lenses (SVLs), respectively. Ortho-k is more effective in controlling myopic progression in terms of axial elongation than wearing SVLs in this pair of identical twins. A Comparison of Vision-Related Quality-of-Life Measures Between Orthokeratology Contact Lenses and Single-Vision Spectacles: Eye & Contact Lens: The results indicate that the significant improvement in vision-related quality of life and acceptability with OK contact lenses is an incentive to engage in its use for the control of myopia in children. Myopia Control in Children through Refractive Therapy Gas Permeable Contact Lenses: Is it for Real? : The December issue of the American Journal of Ophthalmology compares the safety and efficacy of orthokeratology as a nonsurgical treatment for myopia in children with alternate methods. In all of the studies reviewed, the use of orthokeratology lenses proved to reduce myopia, to improve visual acuity, and to reduce the rate of axial elongation. Orthokeratology has been shown to be as effective as other methods in treating myopia and to be more effective at treating axial elongation. There were no major adverse events in any of the studies comparing orthokeratology with other methods of myopia treatment. In conclusion, studies show that the use of orthokeratology is a safe and efficacious nonsurgical treatment for myopia and that it is capable of slowing axial elongation, making it an effective myopic treatment for children. Orthokeratology: An Update: Orthokeratology is the reversible technique of reshaping the cornea by structural changes to the corneal epithelial cells. The effect is a reliable mode of myopia treatment which, despite an increase in higher order aberrations, provides good quality of vision for many patients. Orthokeratology may also have a positive effect on the accommodation/convergence system. The purpose of this paper is to review the literature involving orthokeratology treatment since 2006. Myopia control: the time is now: For over a century parents have asked clinicians if anything can be done to slow the progression of myopia in their children. Most practitioners shrug their shoulders, add another  0.50 DS to the child’s prescription and see him or her in a year. The tide has now turned. A number of treatments have been shown to cut progression rates in half and a motivated clinician could expand his or her practice to incorporate myopia control. Overnight orthokeratology: Many efforts have been invested in slowing progression of myopia. Among the methods, orthokeratology (OK) are most widely used. This study analyzed the efficacy of drops and OK lens in controlling myopia progression and elongation of axial length. Seven-year retrospective analysis of the myopic control effect of orthokeratology in children: a pilot study: Our preliminary 7-year data support the claim that overnight orthokeratology contact lenses may be a feasible clinical method for myopic progression control. Prospective and randomized investigations are warranted to overcome the limitations of this retrospective study. Prentice Award Lecture 2010: A Case for Peripheral Optical Treatment Strategies for Myopia: The overall pattern of results suggests that optical treatment strategies for myopia that take into account the effects of peripheral vision are likely to be more successful than strategies that effectively manipulate only central vision. BMC Ophthalmology: The control effect of orthokeratology on axial length elongation in Chinese children with myopia: This 2-year study indicates that ortho-k contact lens wear is effective for reducing myopia progression in children with low, moderate and high myopia. Myopia Control during Orthokeratology Lens Wear in Children Using a Novel Study Design – Ophthalmology: A prospective, randomized, contralateral-eye crossover study conducted over a 1-year period. The results provide evidence that, at least in the initial months of lens wear, overnight OK inhibits axial eye growth and myopia progression compared with conventional GP lenses. “Spherical aberration, accommodation and myopia” PhD Thesis by Janice Marie Tarrant: The hypothesis that hyperopic defocus from under-accommodation during near work is the driving stimulus in the progression of myopia, motivated studies of bifocal spectacles and progressive addition lenses, as optical treatments for the control of myopia progression, with limited success. In contrast, multifocal (MF) soft contact lenses (SCL) and orthokeratology (ortho-k) have proven to be more beneficial although the mechanisms underlying their anti-myopia effects are not understood. This dissertation, which describes 4 main studies, represents efforts to understand how spherical aberration influences the accommodative response and examines as an explanation for the myopia control effects of MF SCLs and ortho-k the possibility that induced changes in ocular spherical aberration decreases the lag of accommodation. Orthokeratology for Myopia Control: A Meta-analysis. : Optometry & Vision Science: The major purpose of the present meta-analysis was to evaluate the efficacy of orthokeratology in myopia control. This meta- analysis suggests that compared with control, orthokeratology may effectively reduce the elongation of AL to a certain extent, with mean differences of -0.26 mm in 2 years. Moreover, the difference between orthokeratology and control in VCD elongation was -0.18 mm in 2 years. Exclusion of any single study and sensitivity analysis based on various exclusion criteria did not materially alter the pooled results, which added robustness to this main result. Orthokeratology to Control Myopia Progression: A Meta-Analysis: The overall findings suggest that ortho-k can slow myopia progression in school-aged children. Strategies to Regulate Myopia Progression With Contact Lenses: A Review: Contact lenses were reported to be well accepted, consistent, and safe methods to address myopia regulation in children. Orthokeratology is so far the method with the largest demonstrated efficacy in myopia regulation across different ethnic groups. Fluorophotometry to Evaluate the Corneal Epithelium in Eyes Undergoing Contact Lens Corneal Reshaping to Correct Myopia | Journal of Refractive Surgery: Reshaping of the cornea through the use of orthokeratology does not have adverse effects on corneal epithelium as evaluated by changes in corneal epithelial permeability. Efficacy and Acceptability of Orthokeratology for Slowing Myopic Progression in Children: A Systematic Review and Meta-Analysis: In conclusion, with careful education and observation, OK lens use is effective and acceptable for slowing myopic progression in children. Moreover, as the efficacy on myopic control by OK lenses reduces with increasing age, early intervention with OK in young children may be worth considering to reduce the prevalence of high myopia. Special Issue of Optometry and Vision Science Highlights Research Advances in Myopia: New research on myopia-how it develops, risk and protective factors, and potentially effective measures for prevention and treatment are reported across twenty articles in the November issue of Optometry and Vision Science, official journal of the American Academy of Optometry. This special issue on myopia highlights scientific discoveries leading to potentially useful approaches to prevention and treatment of progressive myopia in young patients. Myopic Control using Toric orthokeratology (TO-SEE study: This non-randomized clinical study aimed to investigate the effectiveness of toric orthokeratology (ortho-k) for myopic control in myopic children with moderate to high astigmatism. At the end of 24 months, axial elongation in ortho-k subjects was 52% slower than that in the control group. Toric ortho-k lenses can effectively slow axial elongation in myopic children with moderate to high astigmatism.